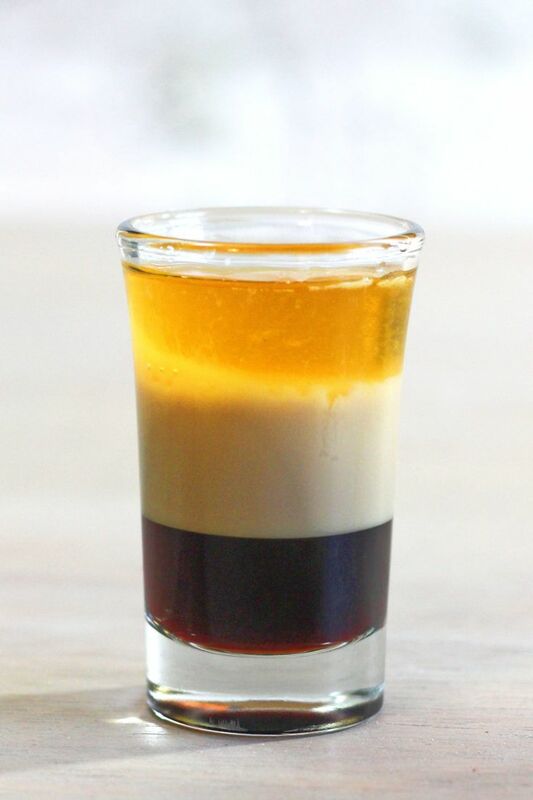 Online, you’ll find quite a few variations on the B52 shot cocktail. The classic recipe layers Kahlua, then Baileys Irish Cream, and then Grand Marnier on top. The flavor is described by some bartenders as a little like caramel. 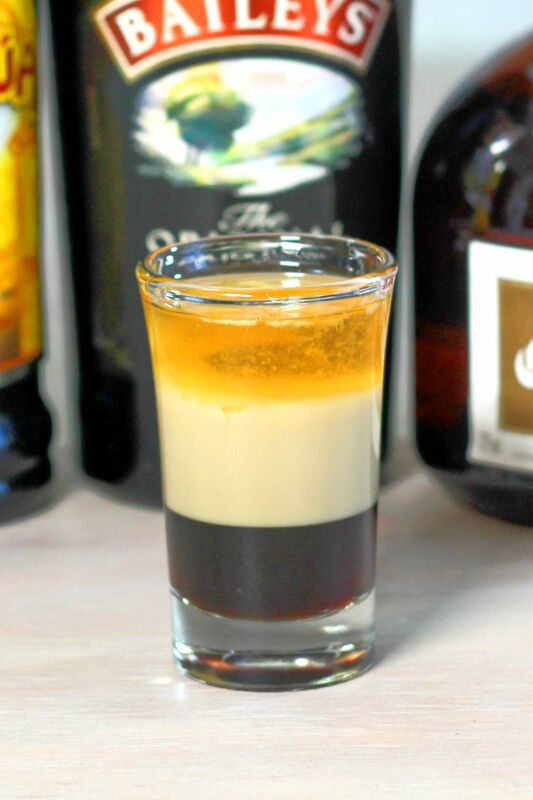 What does the B52 taste like? 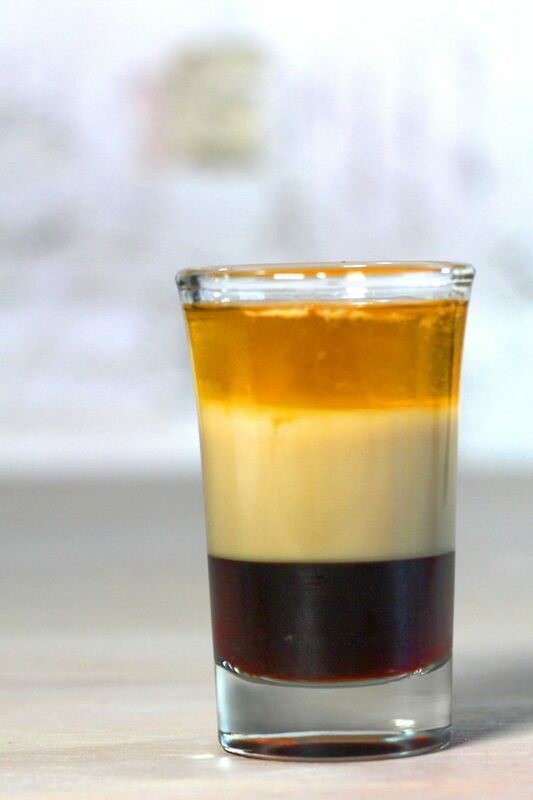 This shot is a subtle blend of coffee, orange, cream and whiskey flavors. There’s no single flavor which stands out much above the others. This drink really deserves to be savored alone – it’s a dessert all on its own. 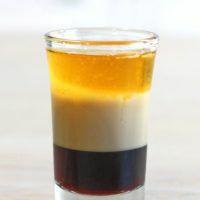 As with most shots, drinkers usually toss back a B52 quickly so they get the flavors of all three layers in one taste. And if you like it like that, go for it. But you can also savor it. The delicious flavor of this drink definitely deserves savoring, nice and slow. Don’t tell anyone I said this, but you can even stir the layers after it’s been served. 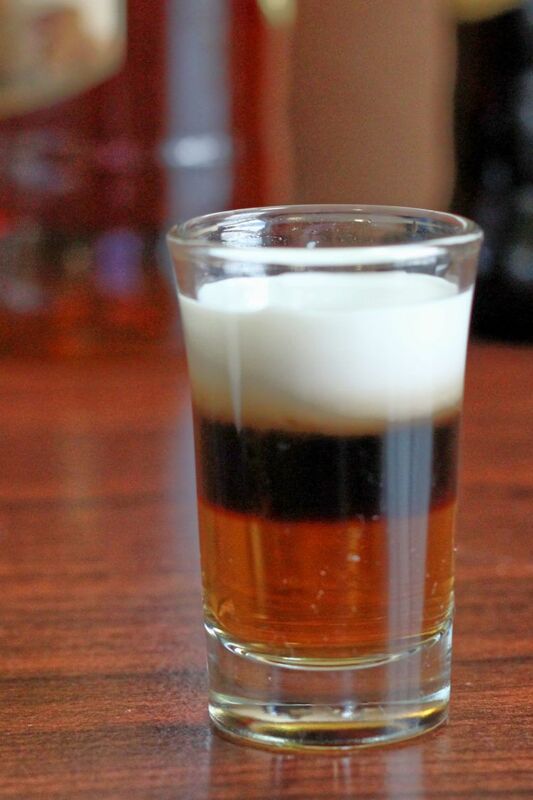 That way, the ingredients of your B52 shot are all mixed together, and you can drink it nice and slow. So let’s get on to the main work of making this drink: layering. First, check out our guide to layering cocktails. It has photos and detailed instructions. It even uses the B52 as its example. If you think you can’t layer a cocktail, think again. It really just takes a little practice. And the effect is so beautiful. And even when you fail, the drink still ends up delicious. 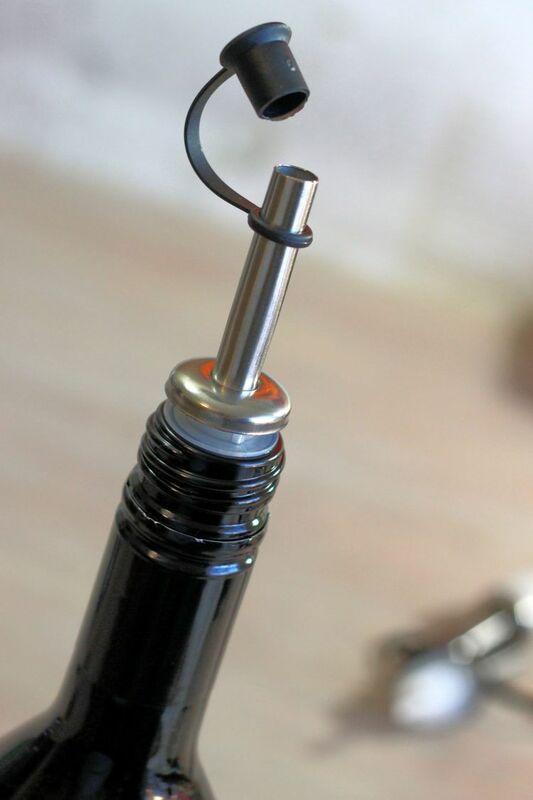 If you don’t like the spoon layering technique, try using pourer spouts in your bottles. These make it very easy to control the stream of liquid from your bottle. That means you can pour as slowly as you want. You just press the pourers down into each bottle of liqueur. From now on, you’ll use the plastic tab attached to your pourer to close the bottle instead of recapping it each time. Put the pourer against the side of the glass. Let the liquid slowly pour. With a little practice, you’ll be able to layer beautifully with this technique. Because the B52 is all liqueurs, it’s a lightweight cocktail. You can afford to have more than one. If you opt to chug it like a shot, you’ll probably want more than one just because it tastes so good. But you can also add some vodka to raise the proof and turn this into a longer drink. Technically, that makes it a different cocktail. But who cares? To do that, just pour each ingredient in equal amounts, using a rocks glass or a martini glass. The vodka can float on top, or you can just stir it all up. Note that some versions on this drink recipe substitute amaretto for the Grand Marnier. That changes the flavor profile of this drink. It removes the orange flavor and emphasizes the caramel notes. It also changes the order of the layers. In the picture below, I made it with Baileys, Kahlua and Amaretto. The Amaretto went to the bottom, the Kahlua floated on top of that, and the Baileys floated on top of the Kahlua. It’s still delicious. It’s just not your usual B52. If you make this drink with the classic Kahlua, Baileys and Grand Marnier, the Kahlua goes to the bottom. The Baileys floats on top of it once again, and the Grand Marnier floats on top of the Baileys. This seems to be the more common way for the B52 to be made. It’s how most bartenders do it. Most people seem to prefer the Grand Marnier version of the B52, but your mileage may vary. The orange notes add something nice and surprising to the mocha notes. That little taste of citrus makes it different. But amaretto tastes amazing, too. You might prefer the drink with amaretto if you don’t like orange, or just if you want to try something different. Some people have asked if you can use different brands of liqueurs in this drink. The answer is yes – any coffee liqueur, any Irish cream, any orange liqueur. But be forewarned that different brands can have different specific gravities, and that determines which liqueurs will settle below or another another. If you do use a different brand and one of them decides to settle unexpectedly below another layer, this is usually okay. One layer can typically sink right through another one and settle after a few minutes. Just be patient and give it time to settle, and now you’ll know what order to pour the layers in for any additional drinks. If you enjoy this drink, you should definitely check out the Irish Flag. It’s another three layer shot. It’s similar to the B52, but features creme de menthe, Baileys and Grand Marnier. You should also check out the Velvet Hammer. It blends cognac and cream with Tia Maria, Cointreau and creme de cacao. 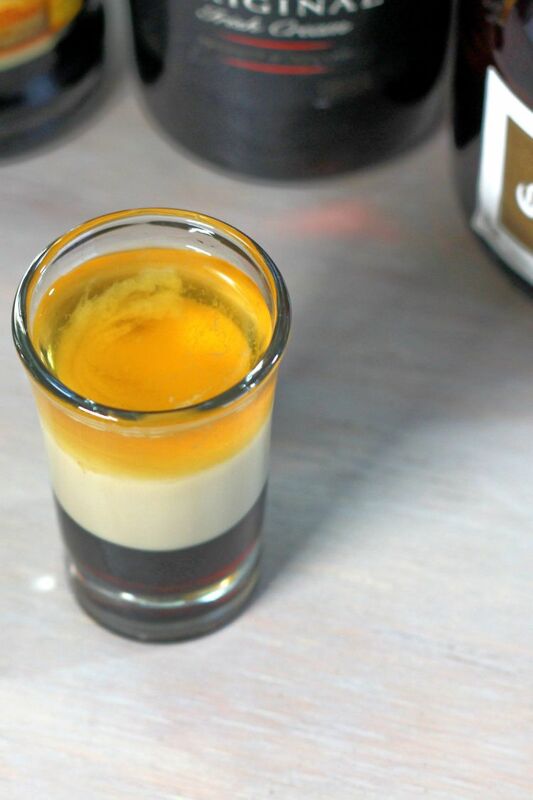 The classic B52 shot recipe makes a delicious, sweet little cocktail that's beautiful to look at, too. You layer three tasty liqueurs, and the resulting flavor is something like cafe l'orange or a caramel candy with hints of orange. Pour the Kahlua into a shot glass. Pouring slowly over the back of a spoon or with a bottle pourer, add an equal layer of Baileys Irish Cream. Still pouring slowly over the spoon or with a pourer, add the layer of Grand Marnier. One of my favorites! I have used many different shaped glasses for this drink, all small glasses (various liquer glasses or shots). I tilt the glass and trickle in the layers from the side. Some people prefer to use a spoon but I find that method easier to stir the contents, which ruins the effect. Why does the photo show the layers in the wrong order? That photo is not of a B-52. The Grand Marnier needs to be on top, as that flavor touches the lips and tongue first, as the rest goes in the mouth.. This drink should be drank all at once to get the best taste…with the Kahlua lingering at the bottom of the glass to round out the flavor for the last drops. It IS a B52, it just depends exactly which brands you use for each product. I can’t remember what I used the day I took the photo. While the GM on top is the most common version in web and book images, I’ve seen it served both ways in bars. I first tried this drink on a cruise ship then a friend brought me the drink recipe from the cruise she took. I made it, it is so good it’s like drinking chocolate milk. It takes a lot of practice. If you use a spoon, put pourers on your liqueur bottles. 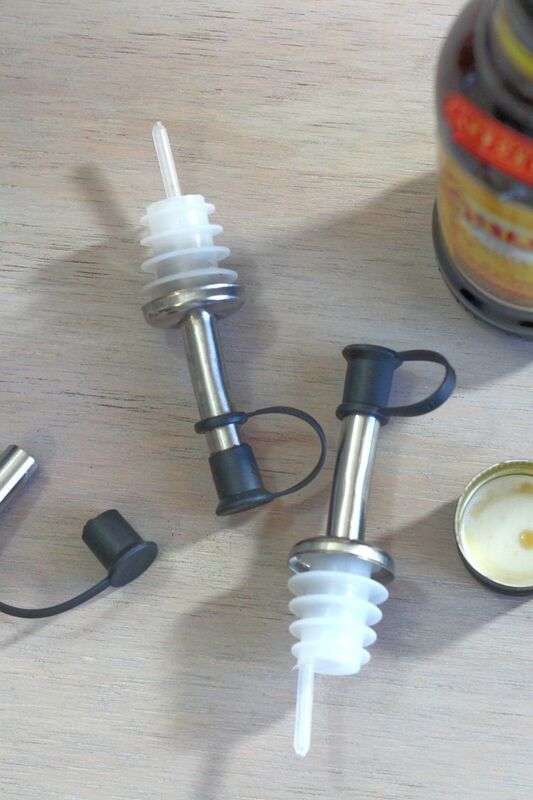 These guys here: https://mixthatdrink.com/go/pourers That’ll make it pour more smoothly. And if all else fails, I have been known (especially when making drinks for photos) to fill a turkey baster/syringe and very slowly shoot each layer into place. That one is pretty foolproof.